Help a child in need receive education to succeed. The Individual tax credit program allows Arizona taxpayers to donate money to qualified STOs and receive a 2019 tax credit of up to $1,138 for married couples filing jointly or $569 for singles. A taxpayer may donate through April 15, 2020 and count their donation as a tax credit in the preceding tax year of 2019. This new tax credit was signed by Governor Jan Brewer in February 2012 and became effective in August 2012. The overflow tax credit is in addition to the Individual tax credit. 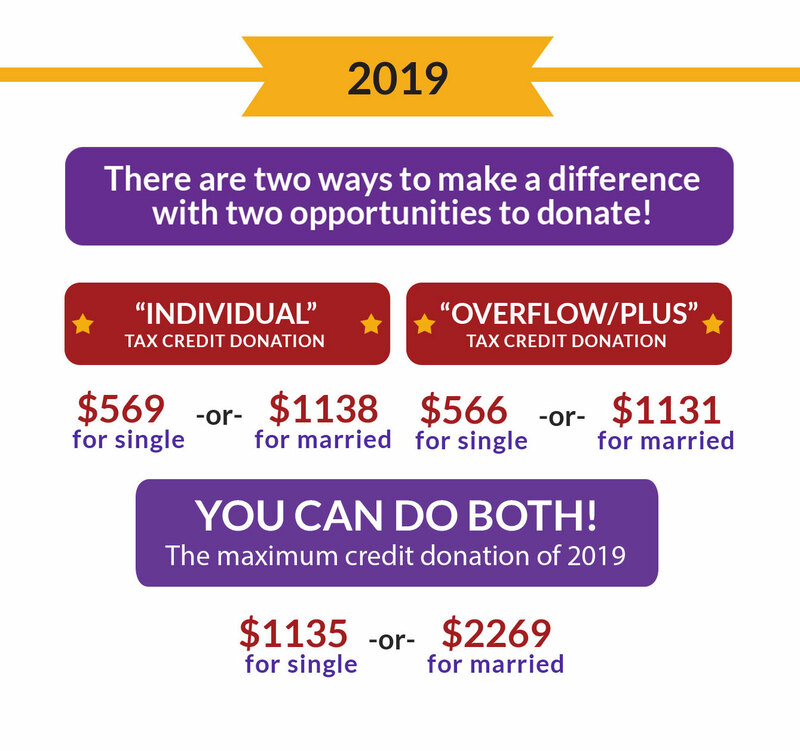 A donor must first give the maximum toward the Individual tax credit, but then has the opportunity to give an additional $1,131 if married filing jointly or $566 for single filer for tax year 2019. A Taxpayer may donate through April 15, 2020 and count their donations as a tax credit in the preceding tax year of 2019. Arizona Tax Credit then distributes those funds in the form of scholarships to students through participating private schools. The Individual tax credit / Overflow/Plus tax credit can be recommended toward a specific student and/or a specific school. Donors participate by making a donation to Arizona Tax Credit and then claiming the appropriate tax credit when they file their state taxes. The credit is used to offset the donor’s Arizona state tax liability and may be carried forward for up to five years. Many families receive donations from relatives, friends, neighbors and coworkers, recommending their children. Those who leverage this program the most successfully are those who spend time explaining the benefits of the program to others and asking them to participate. The funds available through the Individual tax credit program are available to all students enrolled in private schools. Students may receive awards totaling 100% of their tuition costs for the current school year. A student can receive multiple scholarships from one or more STO. If your student receives more scholarship funds than are needed for the current school year tuition costs, the STO will hold the excess scholarship and will disburse the scholarship to the school when the following school year begins. Undesignated funds are also available. Although many donors make specific recommendations for a school or student, there are many donors who do not recommend anyone in particular. Therefore, the undesignated funds may be available to you and we encourage you to apply to a variety of STOs. You may recommend anyone who is not your child or dependent, but the selection committee retains complete discretion regarding all awards. There are no designations or guarantees. - Select -Mr.Ms.Mrs.Mr. and Mrs.Dr. and Mrs.Mr. and Dr.Dr.Dr. and Dr. IMPORTANT: Please only click 'Give Now’ one time. Once your transaction is complete, you will be taken to a Success page. Clicking 'Give Now' twice may cause your credit card to be charged twice. If you are not taken to a Success page within a few minutes, please call or email us to determine the status of your donation.. Thank you for supporting Arizona Tax Credit. Your support will help make resources available to award scholarships to students that may otherwise not be able to attend the school of their choice. Arizona Tax Credit qualifies as a School Tuition Organization (STO) pursuant to A.R.S. Section 43-1089. If you are claiming a tax credit for your donation, you must file Arizona tax form 301 and form 323 along with your Arizona income tax forms. If you are claiming an Overflow/Plus donation as a tax credit, you must also file Arizona tax form 348. Please visit our Individual Donors page to download the forms and instructions. Arizona Tax Credit is a tax-exempt organization pursuant to federal law, Section 501 (c) (3) Federal I.D. number 46-1517816. Arizona Tax Credit provided no goods or services in exchange for this donation. 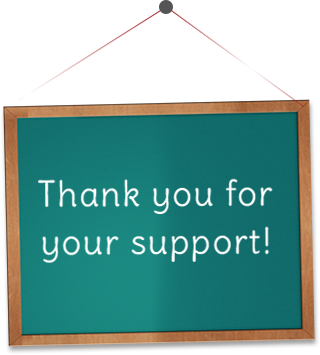 Our sincere thanks to you for making the choice to support students and Arizona Tax Credit today!